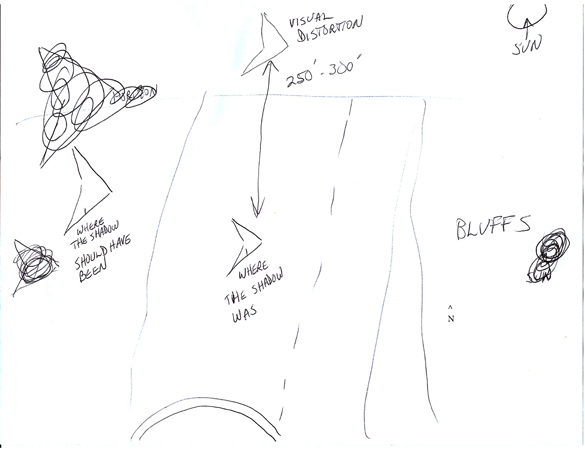 An Arkansas witness at Bella Vista recalled a UFO incident from 2014 when a triangle UFO was seen hovering about 300 feet over a roadway, according to testimony in Case 79743 from the Mutual UFO Network (MUFON) witness reporting database. 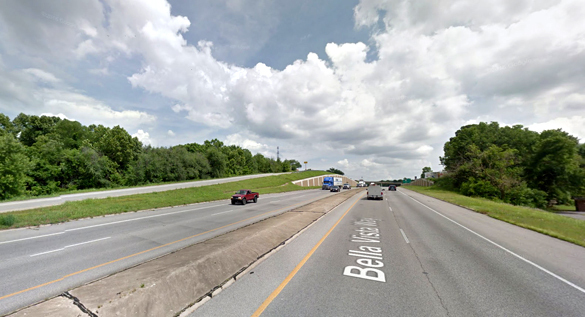 The witness was driving to work at 7:30 a.m. on August 8, 2014, when a shadow was noticed on the roadway about a quarter-mile ahead. The object began to move as the witness approached. The craft’s shadow bothered the witness. 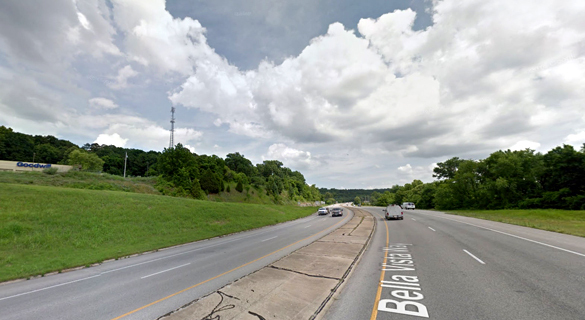 Bella Vista is a city in Benton County, Arkansas, population 16,582. MUFON Arkansas Assistant State Director Lynn Travis McCullough is investigating. Please remember that most UFO sightings can be explained as something natural or man-made. The above quotes were edited for clarity. Please report UFO activity to MUFON.com. 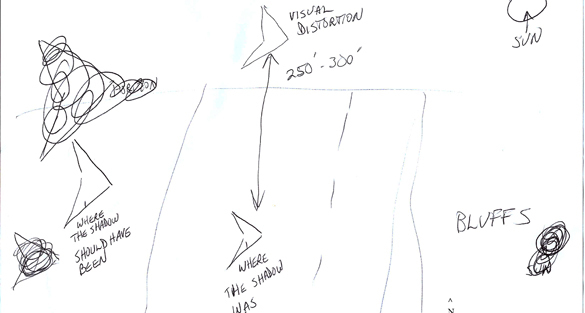 I watched a YouTube presentation recently where the witness described that the sun lit up the opposite (shadow) side of the UFO instead of the sun-ward side. This would suggest that the sun was shining through the UFO and lighting the inside wall near the observer. Perhaps a similar effect was taking place here, whereby the UFO was refracting the light downward toward the ground beneath it. The UFO that I observed in 2014 changed its appearance from a solid to a transparency when it needed to accelerate. Amazed to see this as it sounds similar to an experience I had last year in Central Queensland Australia. I had gone outside my home to have a cigarette about 11:30pm one night and as I often do looked up to view the stars and saw a chevron shape travelling quickly overhead and completely silentl that I could only describe to my wife as appearing ghostly. As if it was there but not there at the same time. Shape matches that of the pictures attached to this article. Still not sure what I saw, but it was no manmade aircraft I have ever seen. Same thing here. I was for holidays on Chios island, specific on a village called Viki which is on the northern part of the island. I was with some friends of mine outside the village for a walk, nightime with a very clear sky and full moon. We were looking up to the sky to see some stars falling and I was looking all around to see a falling star. A friend, Eirini told me to stare to a specific place cause I had more possibilities to see a star falling. So I did. I was down from the road electric light and above of me was the full moon. So I had good front and back light. As I was gazing the beautiful and clear sky, hearing the cicadas and feeling the light air coming on me I suddenly saw it. I was frozen. A flying rectangular transparent object with no sound passed in front of my eyes, under the full moon and above the road electric light. I could see its outline and also the stars behind it. It might have been about 300 meters above and it was flying very harmoniously, it was moving so smoothly and peacefully in the sky like a bird with its wings opened. It had no lights, nothing else on it that I saw. From the time I saw it until it disappeared in the darkness there were passed about 4-5 seconds. The speed of it wasn’t so high, it was like spying with no lights and being transparent. I’m thinking that somehow repulses the photons going over it so thats why I couldn’t see it. I cannot say if it was aliens, humans with human technology or humans with alien technology. I can only guess. That’s all from me.